While the minuscule apartment we live in is definitely not amenable to dog furniture (I mean come on, we have a hard enough time fitting in a couch and a coffee table), we're swooning over this piece from Juicy Couture. Technically, it's called the "Dog Chaise Bed," but doesn't "Fainting Couch" sounds so much more romantic and Mad Men-esque? 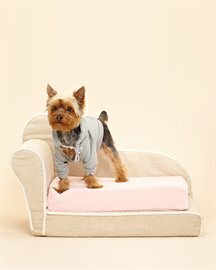 Covered in classic Juicy velour and trimmed with rope around the seams, it is a must for any over-indulged pup that whose home is larger than 500 sq ft.